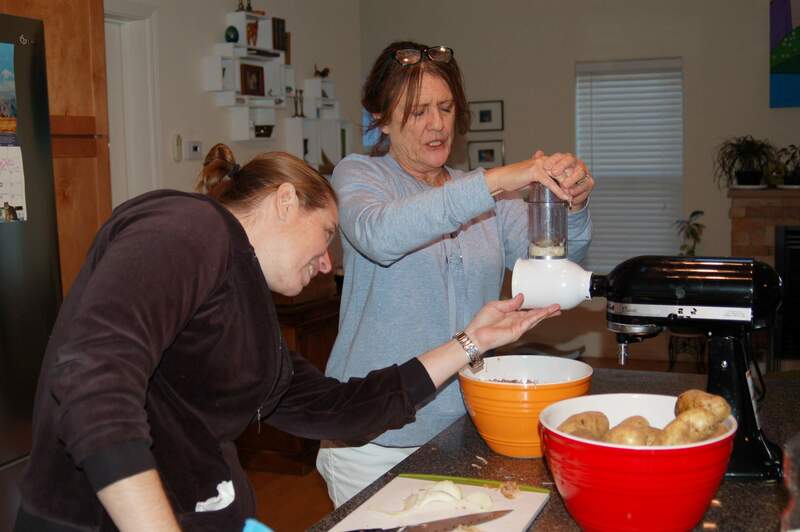 Durango Congregation Har Shalom president Naomi Azulai, left, shows Lisa Deskins, who has never made latkes before, how to use a temperamental food processor. Using a (functional) food processor can save a significant amount of time on the shredding of potatoes and onions. 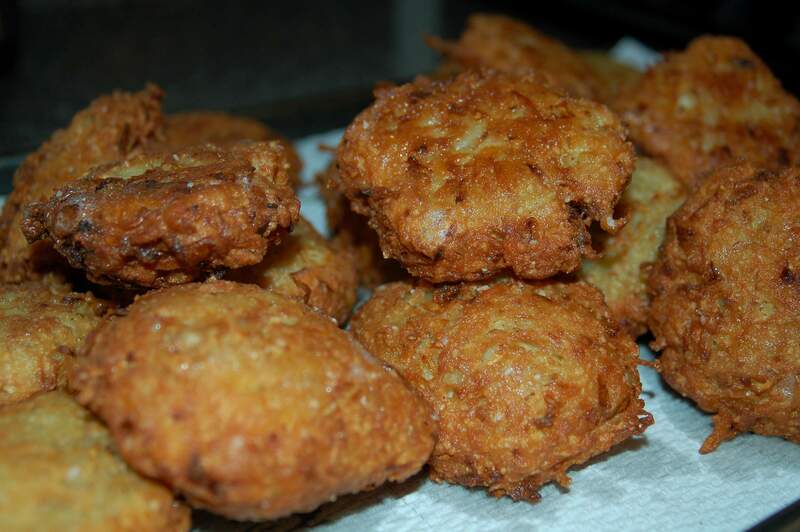 Jews eat fried food on Haunakkah to symbolize the miracle of the oil, says Har Shalom president Naomi Azulai. Latkes are a traditional dish of Hanukkah. The recipe is fairly simple, but many disagree on the proper way to make them. The traditional main course of Hanukkah, the latke – made with potato, a binding agent, egg and salt fried in oil – isn’t as simple as what’s on its crunchy, golden surface. There is as much diversity between the shredded spuds as there is debate among those who eat them. And the dish connects to a history that is almost 2,200 years old. The story of Hanukkah (which falls on Dec. 2 to 10 this year) commemorates the resolve of the Jewish people and triumph over religious persecution. Around 175 B.C., the dominating Greek-Syrian army outlawed Judaism and its customs and desecrated the Holy Temple in Israel. (Jews would pretend to gamble with a dreidel as a way to disguise studying the Torah.) A decade later, a small group of guerrilla fighters, the Maccabees, revolted, and against all odds, won back Jerusalem and liberated the temple. After the Maccabees reclaimed the temple, there was little oil – only a day’s amount – to light the customary eternal flame. But miraculously, the fire burned for eight days, hence the eight days of Hanukkah – and the oil-fried food tradition. Unlike Passover and Yom Kippur, Hanukkah celebrations do not involve a massive feast – but the food is still important. Durango Congregation Har Shalom president Naomi Azulai said it is a festive and kid-friendly celebration. Children love it because their parents encourage them to participate in gambling and pyromania (the dreidel game and lighting the menorah). And the food eaten during the holiday appeals to palates of all ages. “The main dish that most people associate with Hanukkah, and Jews from around the world make, are latkes,” said Har Shalom spiritual leader Linda Smith. The other popular bite is sufganiyot – jelly-filled donuts. They are eaten “any day you have someone willing to fry you up a latke” during the eight days of Hanukkah, Azulai said. Like most traditional dishes, latke recipes have been passed down for generations. Of course, your bubbe’s is the reigning potato pancake champ. But there is more than one way to fry a latke. “If you have five different people making latkes, there will be five different latkes,” Smith said. Some latkes are hand-grated and some are food-processed. Some may even be made with sweet potatoes. Some say it’s a shanda (a shame) to use baking powder, but others do it anyway. Some use flour as a binder and others use matzo meal left over from Passover. The most contentious latke squabble surrounds the accouterments. Smith likes the best of both worlds. She doesn’t go as far as blending the two together, but uses them both simultaneously. Smith references the cheddar-cheese-apple-pie scenario as a way of explaining the strangeness. “It’s a weird combination, yet it works,” Smith said. Azulai likes both but prefers sour cream. She chooses one or the other. Azulai ’s husband, Lior, who is from Israel, said he never heard of applesauce eaten with latkes. Most people from Israel use cottage cheese. So Azulai thinks it just may be an American thing. “It could just come from uncle Morty,” Smith jokes. No matter how the latke is prepared or what condiment one chooses to adorn their potato cake, there is another tradition that almost all Jewish households can relate to: “There is never a latke left, ever,” Azulai said. Azulai admits she doesn’t come from an epicurean family, but she still tries – and succeeds – in her holiday dishes. Last year, her husband called her sufganiyot a Hanukkah miracle. Ingredients: 6 russet potatoes (scrubbed and cut length-wise) 3 halved white onions6 eggs 1½ cups of matzo meal 1 tablespoon of coarse saltPepper to taste Canola or other oil Potential Toppings:Sour creamApplesauce Cottage cheese Scallions Method:With a coarse grater, shred the potatoes. Transfer the potatoes into a clean dishcloth and wring out as much water as possible. Using the same grater, grate the onions. Combine the potatoes, onions, eggs, matzo meal and salt in a large bowl and mix thoroughly with your hands. Pour about ¾ inch of oil in deep pan and heat to medium heat. Separate the potato batter into 1 inch-deep, 3½-inch-round flat disks. 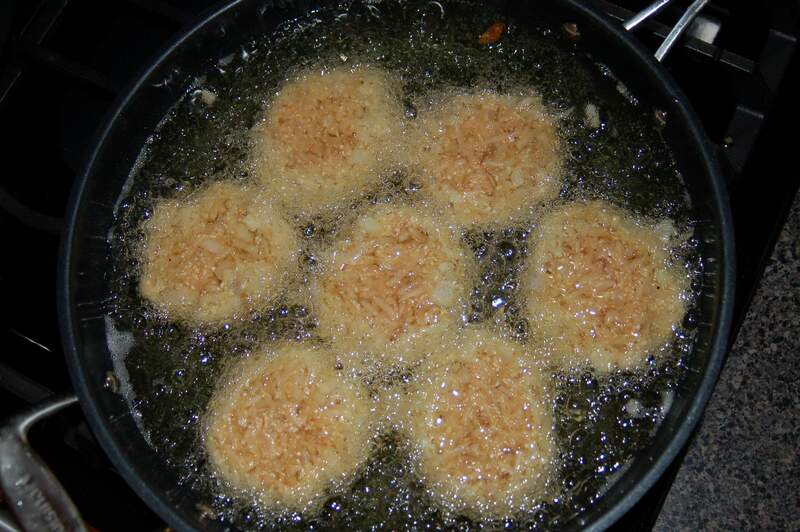 Drop the batter into hot oil and cook on one side for about five minutes or until the edges of the latke are golden brown. Flip the latkes over using a spatula and cook on the other side for another five minutes. Remove latkes and place them on a paper towel to soak up the grease. Serve with the toppings of your choice.